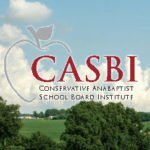 The 2018 Conservative Anabaptist School Board Institute was held in Harrisonburg, VA on March 2 and 3. The program is below. The 13th annual Conservative Anabaptist School Board Institute was held on Friday March 1 and Saturday morning March 2, 2019. The institute serves school board members, principals, and ministers—anyone involved with the overall planning and operation of our Christian day schools. In 2019, it was held in Montgomery, IN. The 2017 Conservative Anabaptist School Board Institute was held on March 3 and 4 in Sugarcreek, OH. Philip names several obstacles that hinder school boards and their schools from effectively accomplishing their mission. He urges a clearly identified mission that includes all the participants in the educational community. Courtesy CASBI.